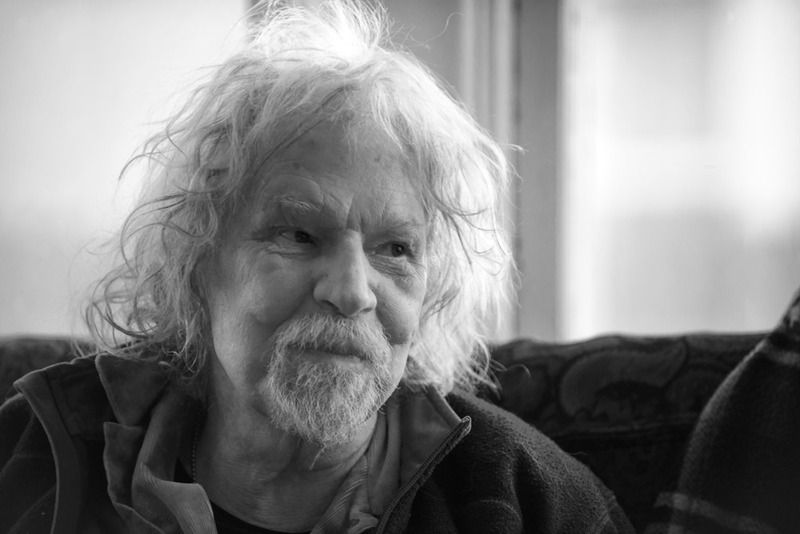 A couple of weeks back a local music legend Willie Murphy died. I’m going to ask indulgence from this blog’s overseas audience, because unless you were around Minnesota in the last 50 years or so, you’ll likely have no idea who Murphy was—no, it’s even more location specific than that—I believe you need to have memories pinned within a few blocks of the intersection of Cedar and Riverside avenues, in a Minneapolis neighborhood near the Mississippi river known as The West Bank. Many years ago the West Bank was a Scandinavian immigrant enclave, and it is now the home to Minnesota’s largest Somali community. But my story today is in-between, in the second half of the 20th century, when it was home to a thriving bohemian culture, immigrants of a slightly different sort. But he was a musician too. Sang, played bass, guitar, and piano. Interpreted a lot of great R&B and wrote some good songs himself. He was never the businessman. He engendered some of the things that entrepreneurs like to claim they do, but he never got the cash rewards. It’s a complicated story and I don’t know all the details—but I do know that he was an artist making art on his own terms right up until his last months of his 75th year. In one trope of musician’s slang, musicians “make the gig” or “make the scene.” Murphy lived that literally: he made a lot of gigs, helped make a scene. Angel headed hipster. Murphy in his later years, still keepin’ on. Mine’s a complicated story too. I eventually fell in love at the same time with two people who lived on the West Bank. There was music most nights and every weekend at a couple of coffee houses, a short-lived jazz club, a music school, and several bars, all of them within four or five blocks. And for my literary side, besides the University, there was Savran’s bookstore, which was well stocked with small press publications and poetry in several languages. In one’s Twenties many are imprinted on the culture encountered then, but the West Bank in the ‘70s seems an especially strong tattoo—and nostalgia fades in reverse. Most change happens slowly enough that you never see it happening. One day you look over your shoulder and you see everything behind you isn’t there anymore. Or you pick up a paper and see that Willie Murphy has died. I felt I needed to write about this, regardless of how well I could do it. The song I wrote “Willie Murphy (Is Always Playing on the West Bank)” has in-jokes and puns that only West Bank habitués will understand. In the first verse I twisted a line from Ginsberg’s “Howl” that also supplied the name of Murphy’s last band. Punned-in the name of some West Bank bars in the second verse, gave a shout-out to Koerner Ray and Glover in the bridge, and got in a sideways nod to the West Bank’s Mixed Blood Theater before I finished. A week ago, I sprung it on the LYL Band and we gave it a go, with Dave Moore supplying his piano part off-the-cuff. You can hear it with the player below. *Murphy recorded an LP with “Spider” John Koerner back in the 60s, and produced Bonnie Raitt’s first LP in the early 70s. 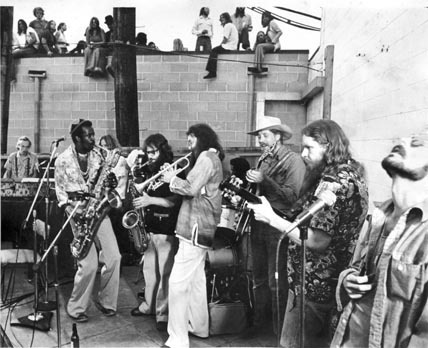 Willie and the Bees was an integrated R&B band that mixed funky jazz and danceable grooves for a decade or so from the mid-70s into the early ‘80s. It’s 1956. World War One had ended less than 40 years ago, instead of 100. Robert Frost is the most celebrated living American poet, and he has traveled back to England to receive honors from both Oxford and Cambridge universities, a symbolic laurel helping to mark the 20th Century acceptance of American poetry into the pantheon of our polyglot language. We approached a white-haired man who was talking to T.S. Eliot. ‘It’s Helen and Eleanor, Robert.’ He turned towards us quickly, unmistakably Robert. Were we as unmistakably ourselves? Eliot smiled at us and withdrew a little…. Robert muttered, ‘Well, well, well.’ Soon he and Helen were talking of their grandchildren. 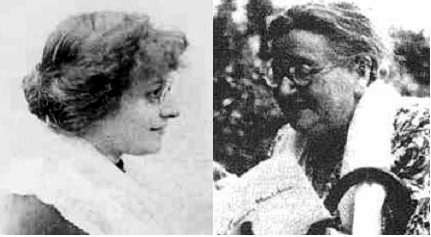 Who are these ladies that broke off the tête-à-tête between the two Modernist poetic titans? One was the widow of Edward Thomas, the man who Robert Frost called “the only brother I ever had.” The other was the woman who had introduced Edward Thomas to Frost in 1913, Eleanor Farjeon. The poet Edward Thomas is not well known outside of Britain, Farjeon even less so, but none-the-less she had a long and varied literary career as a poet, playwright, children’s book author, and songwriter in a life that spanned from the Pre-Raphaelites to Carnaby Street. Back just before and after the outbreak of WWI, the Frost Family, the Thomas Family, and Eleanor Farjeon were a sort of an extended pod of friendship and affiliations. The Thomas marriage had strains, and Farjeon was in love with Edward Thomas. Thomas’ spouse, Helen, surprisingly cast Eleanor Farjeon not as a rival but as a balm to Edward. And so, between her own writing, and typing manuscripts to help D. H. Lawrence (also hanging around this circle*) Farjeon, like Robert Frost, took to accompanying Edward Thomas on his indefatigable walks around the countryside. When Edward Thomas decided to enlist and volunteer for the front lines in the war, the pod all shared correspondence with Thomas, a correspondence that continued right up to the very week of Thomas’ battle-death. And after that, they all shared the task of putting his literary affairs in order and promoting the poetry of the man who had only started writing it during that short pre-war period. Robert Frost and Eleanor Farjeon both wrote elegies for Edward Thomas. It may surprise you, but I’m choosing to use Farjeon’s memorial sonnet here to cap off our Armistice Day series on Edward Thomas, instead of Frost’s poem. Farjeon might have thought of herself as not a “real” poet, but it’s us, the audience, that decides. Her poem may seem to be made of genteel English stuff: gardens, Easter eggs, love tokens, so that it has the patina of an antique valentine—but that’s just the surface. How about those relentless repetitions? You can hear James Joyce or Gertrude Stein tuning up in the distance if you listen for those. Did she mean the punning subtext of the repeated “Eve” with the repeated apples? If this were a Joyce poem we’d assume yes, so why not here? And that surface? It’s a paper scrim she means to tear, to rip—and yet when she does it in the last line, there’s no sound, only an invisible gap, an understated “apology”. Here’s my performance of Farjeon’s “Easter Monday (In Memoriam E. T.)” that you can hear using the player below. *Sounds a bit unconventional for an Edwardian village in 1913 doesn’t it—but any bets on who did the housework? **And it’s in this guise that Farjeon is likely to be best known in the U. S. Back in 1972, three denizens of that Sixties London: Cat Stevens (later Yusef Islam), Rick Wakeman (later caped-keyboardist of Prog Rock fame) and Paul Samwell-Smith (producer and former bass-player with the Yardbirds) created an arrangement of Farjeon’s hymn “Morning Has Broken” for a best-selling LP and eventual #6 hit single on the Billboard U.S. charts. I’m not a fully-qualified Science/Speculative Fiction fan, though I did read it when I ran into it as a young man. Dave Moore, whose voice, songs and keyboard playing you’ll hear from time to time here, read more of it. 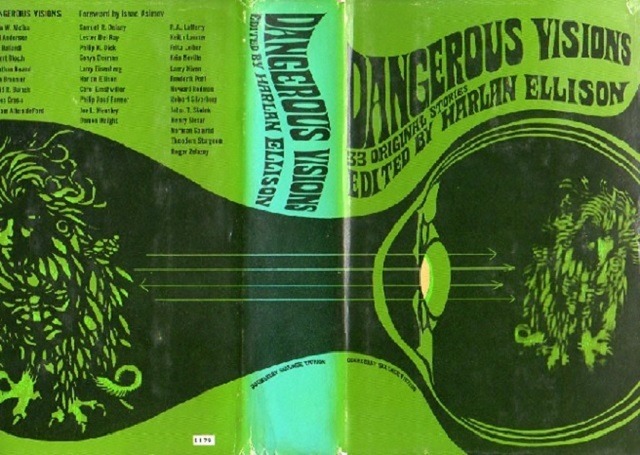 I’m not sure if Dave introduced me to Harlan Ellison’s work, but my memory is that he did loan me a copy of Dangerous Visions back in the Sixties. In that 1967 anthology, Ellison made the case that SF was the heir to a Modernist tradition of fiction using outrageous and unique situations—he was claiming SF could be more Kafka than L. Sprague de Camp. It’s unlikely he was the only person thinking along those lines, but he certainly helped to popularize the idea at a time when an aging generation of SF writers, steeped in pulp magazines and cents-per-word paychecks were in danger of losing touch with the younger post-WWII generation who were more likely to be college educated and experienced in some chemically enhanced inner-space traveling. These two things worked together. SF had always had a darker side, and the border between it and the gothic strain of fantasy or noir-ish mystery was crossed back and forth often. I believe a utopian, Transcendentalist wing of SF remains, but the terms SF and dystopia now seem to follow one another almost automatically. Is this the artists’ fault or ours? A large question that. Thursday night I read that Harlan Ellison had died. Friday I was booked to record with Dave. Friday morning, as I slept, I dreamed that Dave was showing me a binder full of typed manuscripts of stories he had written. As he flipped the pages I read parts of the stories. In style, they were the sort of thing a teenager just starting out would have written, so in the dream’s timeline they would have been written in the Sixties. In the dream, Dave, after learning of Ellison’s death, was telling me that Harlan Ellison had looked over these stories, and that Ellison didn’t like them very much, though he thought the last one had some promise. There was a short, encouraging note from Ellison scrawled in the margin on a page in the story. As I glanced up toward the middle of the page, I saw some dialog in which a character in the story was saying something. The character in this non-existent dream-story was named Octavia Butler. Now I remind you: this is a dream. Dave never had Ellison critique any early stories he wrote. In the dream, these stories existed, in the waking world they don’t. But here’s the funny thing. I told you at the start that I’m not a fully-qualified SF fan. 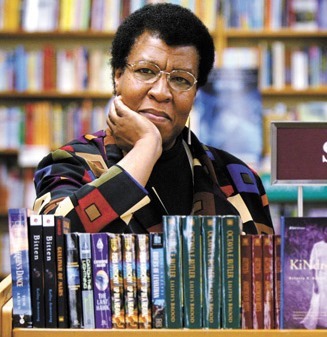 If you had mentioned Octavia Butler to me on Friday, the only impression I would have was that she was a writer. I wouldn’t have been able to name any of her work or have been able to place her in a genre. In the dream, I just thought it odd that Dave was using a writer’s name as a character in a story that the dream had had him writing 50 years ago. I was about to ask him why, when I woke up. I biked off for breakfast and hurriedly came back to write the piece you can listen to below. Looking for info I might use in my song, I searched on Octavia Butler. In the Sixties, Butler was a young, unsure author, fearing that she was too “ugly and stupid, clumsy, and socially hopeless.” While she was still in school, Harlan Ellison, this man with a reputation as a scouring critic, had told her she had promise and should go to the Clarion Conference and present her work there, a suggestion that lead to her first publication in 1971. Nothing there I could use in the song as it turns out, but strangely this was also nothing I knew when I had dreamed that dream early in the morning. I did use one bit I found in my searching: an interview with my former co-worker John Rabe that revealed that Ellison was still using a typewriter as his writing machine in the 21st Century. I thought of those older generation pulp writers and their per-word paychecks. That afternoon, Dave and I recorded “The Apotheosis of Harlan Ellison.” It turned out that in the waking world, Dave had not heard yet that Ellison had died. The player gadget below will let you hear it—though not on your typewriter. This is an elegy, not a love poem, but then an elegy is a love poem that replaces the focus masking the complexity of love with the common mystery of death. Even the images and incidents can have an eerie similarity, as an absence may be at the center of either. The author of today’s piece, Tristian Tzara, is as much as anyone the founder of Dada—if that absurdist movement can structurally support a founder. Like much of the early 20th Century modernist movement, the horrors and changes of WWI accelerated Dada’s development. Proudly anarchistic and rejecting the whole lot of social norms and artistic traditions, Dada was at turns playful and bitter about a European world order that that was itself disordering everything on the continent though modern warfare. 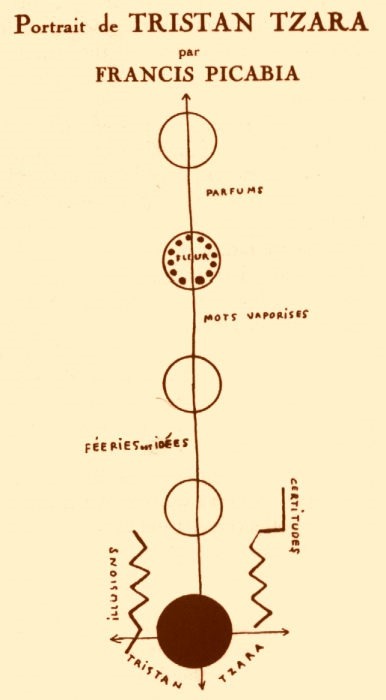 Picabia’s portrait of Leo Fender, or a tube socket schematic? As we’ve learned in earlier posts here, a whole generation was mobilized as part of The Great War. 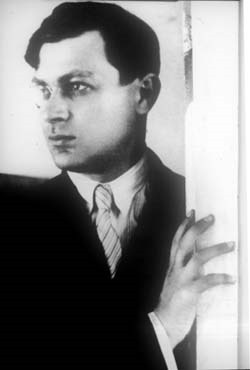 The teenage Tzara, residing in neutral Switzerland, escaped this, but he apparently tried to gain funds from both sides’ propaganda arms to fund Dada activities—which would be just the kind of audacious prank that Dada loved. The subject of today’s piece, Guillaume Apollinaire, was a slightly older member of that WWI generation who should have gone on to even greater things after the war. As I mentioned last time, he had invented the name for Surrealism, the modernist movement that was a post-war outgrowth of Dada. Before that, he had also invented the term Cubism. In France during this time, Apollinaire seemed to know, and was admired by, everyone: composers, writers, painters, theater artists, the whole lot of this vibrant cultural scene. 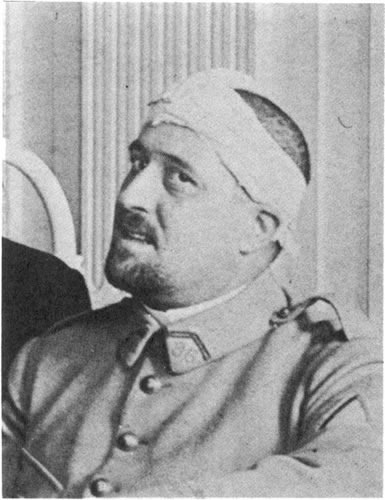 Swept up into the military by the war, Apollinaire was seriously wounded at the front and weakened by his wounds, he died during the great flu outbreak of 1918. His death then leads to Tzara’s elegy, today’s piece. Given Tzara and Dada’s reputation, I was worried as I started to translate this. Translation, particularly for someone like me who is not a fluent speaker of other languages, is already fraught with issues, but doubly so with writers who can use arbitrary absurdist phrases intentionally. When is something unclear, and when is it meant to be so? That’s a question you ask a lot with these writers. I have a prejudice for vibrancy, and if I feel there’s a good image or English phrase hidden in an unfamiliar language’s idiom, I will generally seek to bring it out, but I also realize that I’m fully capable of misunderstanding the writer’s intent. With Tzara’s “The Death of Apollinaire” I grew to believe that this was a sincere elegy for this much-loved artist among artists, and so, translated and performed it as such. Yes, it has its absurd images, but I chose to translate them with clarity in mind. Apollinaire died in November, and so I took the mourning images as a series of late autumn images, and presented them as such. I had the most puzzlement with the line “et les arbres pendaient avec leur couronne” which can be simply left as an unusual combination: a (presumably, shiny metal) crown hanging in a tree-top. As I looked at “couronne” it appears that it’s used also for a laurel wreath crown, and for a funeral wreath too, and for a while thought “wreath” or “funeral wreath” would be the best translation. And then I considered the botanical meaning of “crown” applied to trees, and the follow-up line “unique pleur” made me think of the last leaves in autumn, a rather conventional image—but a great deal of what makes that conventional in English is the popular song “Autumn Leaves” written originally in French by Surrealist Jacques Prévert! My translation: “And the trees, those still with hanging leaves” takes liberties with Tzara’s words, in hopes that I might have divined his image. I’m more confident in how I translated the last line, “un beau long voyage et la vacance illimitée de la chair des structures des os” which I proudly think is superior to other English translations. Musically, today’s performance is a mix of 12-string guitar in Steve Tibbett’s tuning, with electric guitar and bass. As always, there’s a handy player below so that you can hear it. If you like a piece you hear here, go ahead and hit the like button, but it’s even more important in bringing this work to others attention to share it on your favored social media platform. Thanks for reading and listening, and double thanks for sharing! Here at the Parlando project we say we’re where music and words meet. Sometimes words sing without overt musical notation. Sometimes music speaks to you without speech. And since Dave and myself also play the music heard here, it gets to speak for us, we get to say this music. Every musician, whatever their level of talent, skill, and knowledge gets to experience this. Today’s piece, “Frutiger” is an elegy for an artist, Adrian Frutiger, a typographer who created typefaces, the shapes of letters we might use to spell out words. Typography is an unusual art in that we may invest in words a great deal of meaning but the actual ink-shapes that present them on a sign or a page may seem immaterial to that process. Like the music we sometime forget to hear in words, those little carved paintings of letters may disappear below our attention, but their legibility, and even their subtle pointilliste shadings in blocks of text, are still part of our experience of printed words. Frutiger’s most widely used typeface design bears his own name, and it often chosen for signs because its letter forms excel in legibility during inclement weather or from a distance. For example, one of the Frutiger typeface’s distinguishing features is use of square dot on top of the lower case i, which gives it a tiny advantage in the necessary discernable gap between the letter and the dot. In the words of the “Frutiger” piece, I call that out as if the square dot was a diamond rotated (“diamond” just brings in more meaning) and lets me vaguely pun on the Eye of Providence. Three minutes in, and this little elegy’s words are over, but I start a guitar solo. At two minutes in length, that solo will be shorter than the spoken word part, and it was only indirectly called forth by those words. That solo says what? Loss? Anger? An urgent and puzzled prayer? A man using his limited musical skills? A patient LYL Band allowing it to occur? All I can say is that says what I was feeling that day, and today. To hear today’s audio piece “Frutiger,” use the player that appears below.